The Mechanical Engineering Department was established in SDCET in 1999. It is equipped with adequate Laboratories and Class Rooms. Various Labs such as CAD / CAM Lab, Fluid Mechanics Lab, Metrology and Measurements Lab etc. are available in the Department. Big drawing Hall and Central Workshop are available for engineering graphics class and for practicing engineering skills. The Head of the department is Prof. Manoj Jha. He has having 7 years of teaching experience. All the faculty members are well qualified & having a good experience of teaching. 1. Department of Mechanical Engineering have the facilities related to designing work through various licensed version software like Pro-E, CATIA, Auto Cad etc. These soft wares help in the solution of problems regarding designing in various fields like automobile, civil etc. 2. 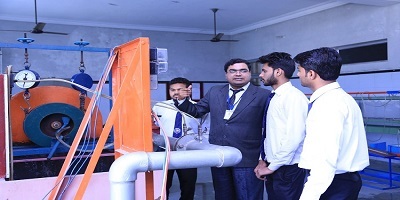 Department of Mechanical Engineering have almost all laboratory equipments as per university curriculum to improve the practical approach of students. Department of Mechanical engineering arranges the personality development program for the improvement of physical issues of the students as well as faculties. 3. Department of Mechanical Engineering has wi-fi facilities for fast connectivity everywhere any time. Extra classes arranged as per students requirements for various topics by subject experts. Department of Mechanical Engineering has separate departmental Library enriched with various reference and textbook for the help of students and faculties.